What do Sustainability Ambassadors actually do? See some of the projects they’re working on, and find out how they use them to engage more people across campus in sustainability issues. The Sustainable Development Goals (SDGs) are a collection of 17 global goals set by the United Nations General Assembly and adopted by countries around the world. They are a universal call to action to end poverty, protect the planet, and ensure that all people enjoy peace and prosperity in a world where no one is left behind. 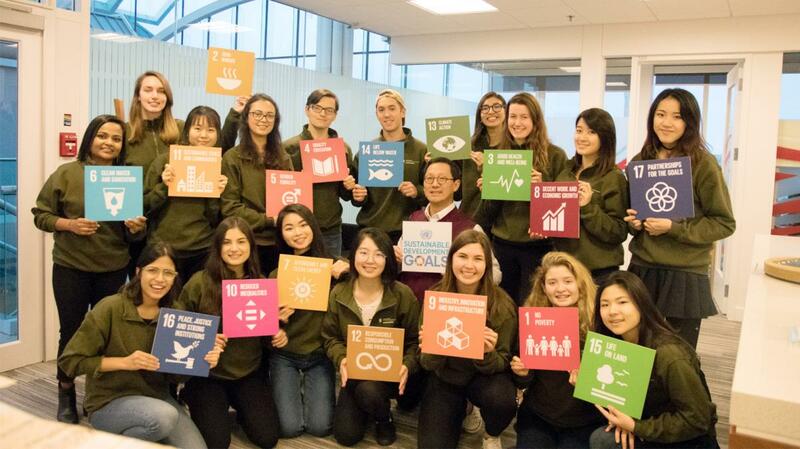 The Sustainability Ambassadors are hosting and inviting UBC Student-led organizations, groups, and clubs to attend the SDG Roundtable. Besides boosting awareness of the SDGs, the aim of our SDG Roundtable is to facilitate increased collaboration among the diversity of UBC student organizations on various goals that they share. Through active discussion and listening, the SDG Roundtable will encourage groups to recognize that sustainability is wholly interconnected and that we are more connected to one another than we may think. We believe that groups participating in this Roundtable event will benefit from diverse perspectives and be able to further their respective goals through the help of one another. If you or your group is interested in participating please sign up online. We will be in touch with you with more details. You may also contact us at sustainability.ambassadors@ubc.ca for more info. We look forward to seeing you at the SDG Roundtable. The interconnectedness of sustainability challenges must be addressed to meet the urgent environmental, political, and economic challenges the world currently faces. Presented as part of the 2019 UBC Student Leadership Conference, this workshop focuses on social, economic, and environmental sustainability, encompassing multiple perspectives, to explore the connections between leadership and sustainability. With a focus on the Sustainable Development Goals (SDGs) – a collection of global goals set by the United Nations in Agenda 2030 – attendees will gain the tools and knowledge to critically implement the SDGs as leaders in their communities, contributing to a more prosperous, safe, and sustainable planet. Organized by Sustainability Ambassadors and supported by UBC’s Sustainability Initiative, the Sustainability Fair aims to inspire students, faculty, and staff to become involved with sustainability through engaging activities and informative displays. The fair is an interdisciplinary and intersectional event showcasing businesses, organizations, and student groups that aim to create more equitable, livable, and inclusive communities. Our goal this year is to educate students about some of the sustainability issues they may be less familiar with, and to promote new or innovative methods of practicing sustainability. This event is made possible with support from UTown@UBC, AMS Sustainability, UBC Student Environment Centre. Build connections and deepen your knowledge of the world. The Sustainability Research Symposium brings together students, staff, researchers, and speakers from various fields to engage in an interdisciplinary exploration of economic, social, and environmental sustainability. This year's Sustainability Research Symposium is on March 14, 2019 in CIRS with the theme of Urban Sustainable Cities. This event is made possible with support from UTown@UBC, AMS Sustainability, UBC AMS, UBC Student Environment Centre, EVO Car Share, and Dive into UBC. Are you interested in pursuing a career in sustainability? Sustainability Career Connections will connect you with alumni working in the industry. Hear about their path, and how they have transformed their education into a career. Presented by the Sustainability Ambassadors, the Sustainability Career Connections event aims to inform UBC students and alumni about the different sustainability-related businesses and organizations in the Lower Mainland. This two-hour event features a panel discussion followed by a “Table Talk” (mix-and-mingle). This is your opportunity to connect with a diverse panel of alumni working in various fields of sustainability and hear about their path, and how they have transformed their education into a career. Snacks and refreshments will be provided. Please bring your own mugs and containers to help us reduce waste! An evening of environmental and social sustainability stories shared by student and community leaders, on how they have turned their failures into success and growth. This event aims to serve as an opportunity for leaders of different backgrounds to connect over their shared values, with the possibility of deciding to collaborate in the future. The 2017/18 Ambassadors worked with campus stakeholders and film students to develop 4 short films to integrate into student training, screen at events, and as a UBC student facilitation tool.